The role of digital content in our everyday lives seemingly expands every day. From eReaders to iPads to online-only news subscriptions, many of us look at screens more than we look at books or magazines. This shift brings a wider range of content to wider audiences, but unfortunately the blind and visually impaired have been left behind this technological revolution. While some refreshable Braille displays exist today, they are typically limited to one line of text at a time and are prohibitively expensive. A team at the University of Michigan led by Dr. Sile O'Modhrain, who is blind herself, set out to change that with the Holy Braille Project. The project began in 2013, and is a part of the HaptiX lab at the University of Michigan. Team member Alex Russomanno is a Mechanical Engineering PhD student, and he used his expertise with microfluidics to engineer the display of the Holy Braille device. The display employs air pressure that pushes each dot of Braille by an individual valve under a thin membrane. The use of microfluidics makes the device much cheaper than the options currently on the market relying less on electronics and more on mechanics. 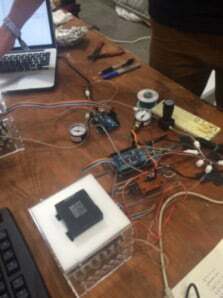 An Arduino controls the valves individually and can be coded to perform a variety of tasks. The system can be used not only to operate a keyboard or display text, but also to show different types of content like charts or spreadsheets. Other Braille products today only can only show text. The Holy Braille Project therefore opens up new possibilities for the type of content that blind and visually impaired people can access, not just the amount of data that can be displayed. The current prototype for the project is cube-shaped, and while it is seemingly small and compact, the plan is to make it smaller and flatter. The next step of the project is to essentially flatten the device to make it more user-friendly and marketable. Alex is certainly motivated by the work, but it is also his thesis research which adds additional motivation. The Holy Braille Project already has a provisional patent on the technology, and with the aid of a grant from the University of Michigan, the group is working to create a company and commercialize the project in the near future. If they are able to create and sell a commercial product, they will be the first to put a large, low-cost display on the market to help solve a major accessibility problem with digital content. Danielle Roof is a senior at Tulane University originally from San Carlos, California. She is studying Political Economy and Education, and hopes to go into teaching. Her favorite things to do when she's not studying are dance, yoga, and traveling to new places.